Faux inset pleats create flattering lines and crisp, clean style in our fashion-friendly sweater with three-quarter-length flared sleeves. 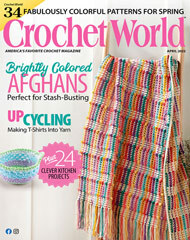 This e-pattern was originally published in the January 2010 issue of Crcohet! magazine. Size: Includes women's small through 3X-large. Made with fine (sport) weight yarn and size H (5mm) hook.